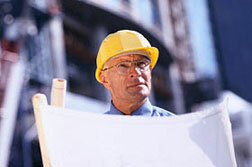 Fully-written Commercial Construction Quality Control Plans range in size from 30 pages to over 200. Available for general contractors, specialty contractors, and professional services companies. Your QC Plan will comply with your project requirements. Personalized with your name, logo & project info. We'll assemble a plan based on your company and contract specifications and personalize it with your company name, logo, and project information. See Contractor Type for more information on specialty plans. Includes trade-specific inspection forms w/checkpoints, lists applicable codes, industry standards, credentials, and qualifications for the division work you do. Download a pdf List of available inspection forms. Personalized Plans or Instant Download available. Personalized plans include your company logo, company name and project name and make a very nice, professional presentation. If you don't mind adding your own company name, logo, and personnel/org. chart, you can purchase the document from our online store with a 10% discount. Here is a link to the online store page. Download a Plan Sample and see what you'll get in each section of your QC Plan. Or, Call us at 410-451-8006 and we'll answer all of your questions.